Finally see where all that liquor is going! Our sensors monitor bottles in real-time, so you know precisely how much was poured and when. This will give us data for each drink made. Our software points out suspicious bartender activity, such as heavy pouring, skimming, substitute pouring, free drinks, and more. We understand most operators don't want all free drinks to end completely; what you do with the information is up to you. With the click of a button, our sensors are able to tell you how much is in a monitored bottle, making inventory a snap. We are a group of P.O.S. providers, I.T. professionals and bar owners who are on a mission to put the $10b in domestic annual liquor losses back in operators' pockets. We love working with F&B operators, and we're excited to help you save money! You Get Analytics, Auditing and Inventory Instantly! Use the calculator below to calculate your annual savings with WeighUp! What POS systems will you integrate with? Aireus • Aloha • Breadcrumb • Brink POS • Clover • Digital Dining • Dinerware • Firefly • Focus • FuturePOS • Gusto • HSI • InfoGenesis • IRIS POS • Maitre'D • Micros • Prism • Northstar • onePOS • pcAmerica • POSiTouch • Revel • Revention • SmartPOS • SoftTouch • SpeedLine • Square • Squirrel • Thrive & Toast! Don't see your POS here? Click here to request an integration! How will you know who made each drink? Part of the data we gather from the POS system is who is clocked in and as what job. Also, we can work with your POS vendor to ensure the POS system is setup accordingly, particularly if you have multiple wells/more than one set of bottles. Do I have to get one of the packages or, can I get the number of sensors I want? You can get however many sensors you need, with a minimum of 10 per location. Contact us for a custom quote. What happens if a sensor breaks? What devices can I use your system on? Our system works on any device with a web browser. We are optimized for all device types, so you can expect a great experience whether you're on an older smartphone, a newer tablet, or your standard desktop. Will your system do inventory? The word "inventory" means different things to different people. Our system tells you how many unopened bottles you SHOULD have, as well as how much is in each monitored bottle. We also know how much you SHOULD have used. However, we cannot count the unopened bottles in your liquor closet with our sensors! Coming to Restaurants and Bars Near You in 2019! Especially if you want to become an early adopter or distributor! We're a group of restaraunt technology nerds with decades of experience. 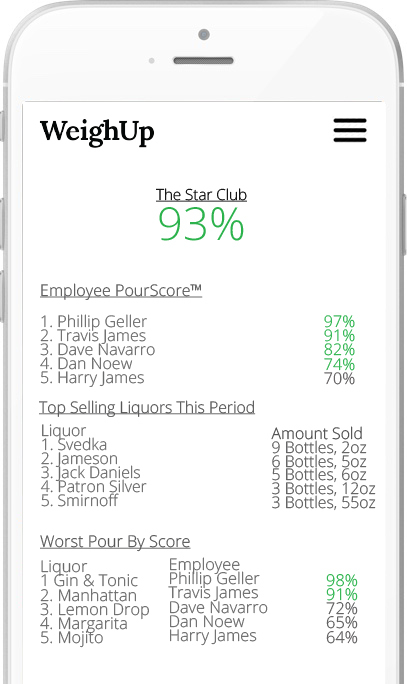 We set out on a mission to track liquor in a better way; and we did it! Doing a story on WeighUp? Click here to download our Brand Guidelines and Press Kit! Copyright © 2017 - 2018 WeighUp. Patent Pending.